When the weather turns hot overnight, as it seemed to do this weekend, I reminisce about my summers past and seafood. I am a huge fan of “frutti di mare”. I love taking trips to The Nautical Mile in Freeport, City Island in the Bronx, and Sheepshead Bay in Brooklyn. They sort of define summer holiday weekends to me. So, this past weekend I decided to experiment a little bit with the ol’ grill. We were having grilled sausage and peppers for dinner (another summertime favorite), but I needed a seafood fix. Mrs. Notafoodie picked up some large shrimp from the fishmonger in Grand Central, and we were off to the proverbial races. Now, as you can probably guess from the title of this post, I could not just leave well enough alone. I needed to amp these little suckers up a bit. Right about now, I bet you’re thinking, “simple, wrap them in bacon and throw them on the grill”. I am a fan of bacon wrapped anything, but I was craving the taste of shrimp and didn’t want it to take a backseat to the intense smokiness of bacon. I decided to use another piece of the pig. I sliced a few strips of my home cured guanciale. For those of you who haven’t read my post, guanciale is something I discovered a few months back. It’s basically pancetta, but instead of making it with pork belly (like bacon), you make it with the most delicate part of the pig, the jowl. With that, construction began. I went out to the trust ol’ herb garden. I picked a few sage leafs. I patted dry the shrimp (so that the sage leaves would fry in pig fat instead of steaming). 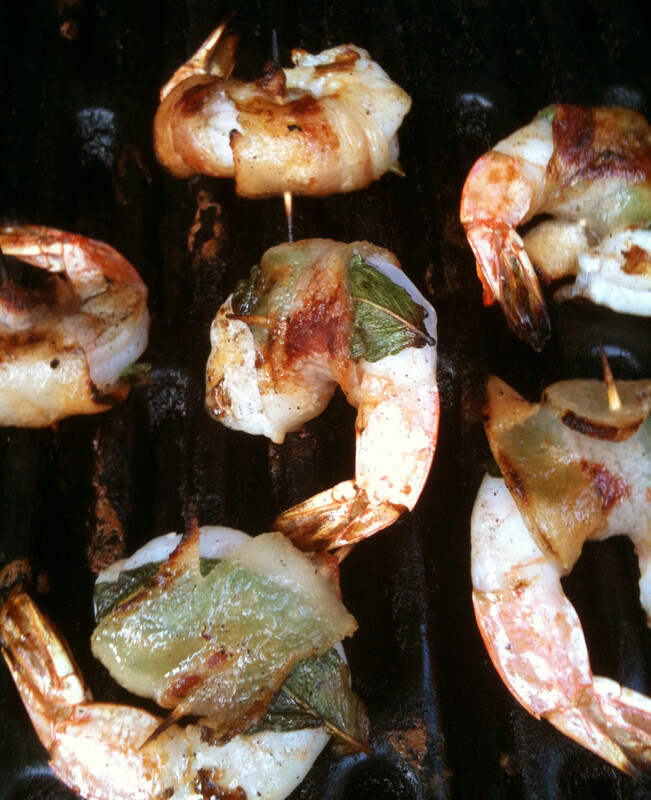 I laid a sage leaf on each shrimp and wrapped them in an individual pork blanket. The handy dandy iPhone camera does it again! The result was an appetizer that was insanely flavorful. A lesson that I learned from Chinese dumplings is that shrimp and pork go together amazingly. The sage leaf was crispy and added a perfect compliment to the porky flavor. It was more complex than just wrapping a piece of bacon around the shrimp. As long as I have my jowl, this dish is going on my appetizer menu for summer grilling. I’m thinking of going in to the guanciale making business. I’m taking orders. $20 per lb. Minimum order is 5lbs. Who’s in? ← What sandwich are you? Let it be known that I will always accept creative bartering for pork products! Is there a discount for your son’s grandmothers? You can pay us back in babysitting services. Everyone wins!